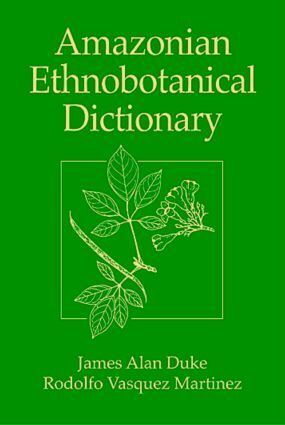 The Amazonian Ethnobotanical Dictionary presents an exciting new rainforest book, designed and conceived in the rainforest and dedicated to its preservation.The book contains concise accounts of the various uses to which prominent Amazonian plants are put by the local rainforest inhabitants. Although emphasis is placed on plant foods and forest medicines, there is also commentary on other relevant applications, including natural artifacts, house construction, natural pesticides, and ornamental and fodder plants. More than 1,000 species are covered and over 200 illustrated. An index to Spanish and English names leads to the scientific name, and the index to plants provides its medicinal application. There are even suggestions on how to eat palm grubs and how to make an Amazonian salad dressing. All royalties from the book are donated to the Amazonian Center for Environmental Education and Research (ACEER) in order to continue its preservation of one of the world's most diverse forests.